X PORCELANOSA Group Awards. A new challenge for the world of architecture and interior design. As with every year, PORCELANOSA Grupo presents the bases of the PORCELANOSA Architecture and Interior Design Awards. Thus, this firm opens the participation at the tenth edition of a contest that hopes to break records in relation to the receipt of candidatures. 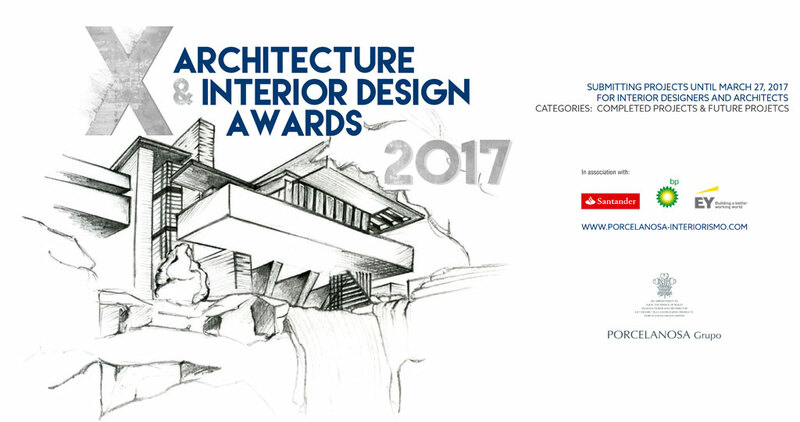 Again, the main goal of these Awards is to promote new values in the field of design, as well as serving as a platform for the recognition of projects from consolidated professionals. Thus, once again, the Awards will have two different categories: Future Projects, with sections aimed at Students and Professionals, and Completed Projects. With regard to Future Projects, both students and professionals, this tenth edition proposes the design of a Work Studio or workspace. Participants in this category should have a free rein with regard to their creativity in the planning and distribution of space. Surfaces can vary between 250m2 and 500m2 according to the participant’s choice, and the project may be based on a real or fictitious space refurbishment, as well as a newly created project. As with every year, another of the indispensable premises is the use of the materials and products from the PORCELANOSA Grupo, which will be reflected, along with both the ideas and concepts, in the project’s memory. The project presentation, as well as its concept and development will be evaluated. Besides, it will also take into account the originality, the unit concept of the project, the coherence of all the spaces designed or the novel and unique use of materials from PORCELANOSA Grupo, among other issues. Another category in the PORCELANOSA Grupo Awards is the Completed Projects. In it, professionals and both architecture and design studios that have done unique projects with materials from the Group’s companies are given an award. As in the aforementioned categories, participants must submit a detailed project report, both technical and conceptual, explaining the leitmotiv of the presented project. Once again, the originality and the design set up, the integration of the project and its interior architecture in the surrounding atmosphere, and the unique application of the PORCELANOSA Grupo materials, including new designs and their uses. So, the unique inclusion of the submitted floor tile and wall tile from Porcelanosa, Venis and Urbatek applications, bathroom equipments and kitchens from firms such as Gamadecor and Noken, natural materials and porcelain tile from L’Antic Colonial and Urbatek, respectively, innovative building solutions from Butech or the KRION® Solid Surface compact mineral, in any of its multiple forms, will be taken into account. It is now possible to register for the contest, a process that will remain open until next March 27, 2017, the deadline for handing in the projects. This will be done in a virtual way by using the link and the username provided in the registration, along with the reference number. Without a doubt, an excellent opportunity for professionals and Architecture, along with Interior Design to showcase their talents as being the yardstick for both design and innovation in the sector.